With ultra-clean fuel available at pumps, diesel cars are re-entering the U.S.
NEW YORK (CNNMoney.com) -- With rising gas prices, diesel cars and SUVs are gearing up for a major American comeback after a brief appearance 25 years ago. But if all you remember are the smell and noise, you might not recognize the new leaner, cleaner versions. 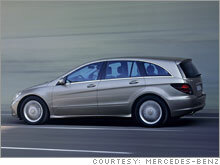 Back in the early 1980's, 80 percent of the cars Mercedes-Benz sold in the U.S. were diesel powered. General Motors sold diesel Oldsmobiles and Cadillacs. BMW says it will bring one or more diesel-powered cars to the U.S. by the end of 2008. In Europe, 45 percent of BMWs sold are diesels. Mercedes-Benz is planning to introduce diesel versions of its R-class (shown here), ML and GL SUVs to the U.S.
Audi is expected to bring a diesel version of its Q7 SUV to the U.S. The reason then was obvious: Adjusted for inflation, the cost of gasoline then was about $3.15 a gallon. Buyers were looking for a more fuel-efficient way to drive. Diesel engines were noisy, they were slow and they puffed out nasty polluting smoke. But they used much less fuel than gasoline engines, so buyers were willing to put up with the downsides. As gas prices went back down, relative to other costs, and environmental regulations became stricter the tide of diesels rolled back across the Atlantic leaving only memories of clanky, foul smelling diesel cars. Today, while half the cars sold in Europe are diesels, diesel market share in the U.S. is about 3.5 percent and that's mostly pick-ups, according to R.L. Polk & Co.
With a hungry European market to feed, diesel development has continued, creating turbocharged diesel engines that perform better and pollute less. Today's diesel cars are virtually indistinguishable from their gasoline-burning siblings. Except they use a lot less fuel. "Anyone who's spent time overseas has seen and driven some very competent diesels," said Charlie Vogelheim, vice president for automotive development at J.D. Power and Associates. Diesel engines are more efficient than gasoline engines, in small part, because diesel fuel contains more energy than gasoline. Diesel engines combust the fuel by squeezing air to extremely high pressure inside the cylinders. Just as the air is being squeezed to maximum pressure, fuel is injected into the cylinder where it combusts immediately in the hot air. (When the car is first started the cylinder is pre-heated by a "glow plug.") That high-pressure ignition - much higher pressure than is possible in a gasoline engine - contributes most of the added power. These modern diesels have exhaust that, on a mile-to-mile basis, is close to gasoline in terms of smog-forming pollution. Already, because they don't need to burn as much fuel, they emit less carbon dioxide than gasoline engines. Excess CO2 has been blamed for global warming. Even with the new fuel, scrubbing diesel emissions this clean isn't cheap or easy. That's one reason most car companies are entering the market with diesel-powered SUVs first. Heavier vehicles have easier emissions standards. "Those are the vehicles that are in greatest need of greater fuel economy," Diesel Technology Forum executive director Allen Schaeffer said of SUVs, offering another reason diesel engines are appearing first in those larger vehicles. The new Mercedes SUVs, unlike the car and the diesels SUVs the company sells here now, will be available for sale in all 50 states. Even the cleanest European diesels now available can't meet emissions standards in five states - California and New York among - that are even stricter than the federal government's. Chrysler, the American arm of DaimlerChrysler, and Volkswagen already sells "45 state" diesel SUVS. Chrysler sells version of its Jeep Grand Cherokee SUV that uses an engine from German division Mercedes-Benz. Volkswagen sells a 10-cylinder diesel version of its Touareg SUV here. Until 2006, VW sold a full line of diesel-powered cars here, including the Golf, Jetta and New Beetle. But those vehicles weren't clean-burning enough to meet stricter emissions standards for cars that were phased in this year. The diesel Jetta sedan will be back next year, however, in a cleaner running version that will meet emissions standards in all 50 states, VW says. 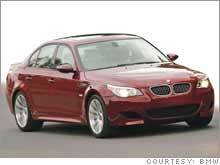 BMW plans to begin selling one or more vehicles with a 3.0 liter twin turbo diesel engine here by the end of 2008. The BMW diesels will be available in all 50 states and, BMW promises, they will drive just the way people expect a BMW to drive. 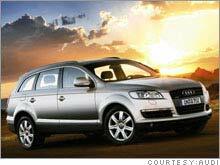 Audi is expected sell a diesel version of its Q7 SUV here. Nissan and Honda will be entering the market with diesel cars. Nissan recently announced it intends to bring a diesel version of its Maxima sedan to the U.S., and Honda says it will sell a diesel four-cylinder car here in a few years. What car, exactly, that will be hasn't been announced. Korean automaker Hyundai is planning to bring a diesel version of its just-introduced Veracruz SUV to the U.S. in 2009 or 2010. Neither Ford nor GM has any plans to try again with diesel passenger cars or SUVs for their home market. It wouldn't be cost-effective for them, a Ford spokesman said, because Ford cars available in Europe as diesels aren't sold here. And the market is too small for them to develop U.S.-only diesels. Market acceptance of diesel passenger vehicles should grow here again, Vogelheim said, as consumers experience the new, cleaner engines. Diesels performance characteristics should appeal to Americans who like a lot of "off the line" power for quick acceleration, said Allen Schaeffer, executive director of the Diesel Technology Forum. Diesel engines produce a lot of low-speed torque, the twisting power needed to get the wheels moving, but that power is produced in a rather narrow range of engine speeds. Almost all modern diesel engines today are turbocharged, which helps to improve performance to something more like what drivers are used to from a gasoline engines. Whether we start regularly seeing diesels on American roads will probably depend more on the supply of vehicles than demand, said Vogelheim. Once gasoline tops $3.00, there should be plenty of demand, he said.